Add the dimension of sound to the popular Photo Throw. As you wrap yourself with their image now you can hear your loved ones at the touch of a button. 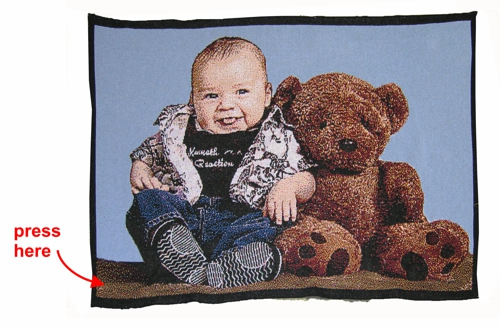 Imagine the excitement Grandma will feel when she hears her grandchildren wishing her a happy birthday or anything else from her very own personalized Talking PhotoThrow. Wonderfully Soft PhotoThrow made of Cotton Fiber. Pocket sewn into back holds recording device.